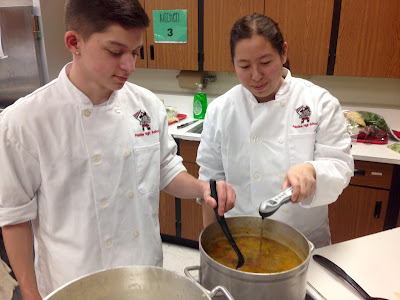 This time of year, for about as long as I can remember, our Chemistry of Foods students, and their teachers, create a variety of delicious soups, and serve lunch to the staff in their decorated kitchen classroom. 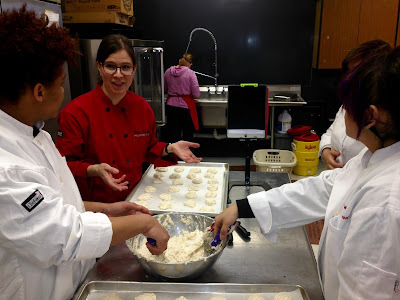 Minestrone, chicken noodle, broccoli and cheese; faculty and staff pay a few dollars to eat some hot, tasty soup while providing aspiring culinary artists the opportunity to demonstrate their skills authentically. For a few dollars more, the diners can keep the ceramic bowl, also created by our students. Proceeds from the Empty Bowls project are donated to the Palatine Food Pantry. Service with a smile, and also a few tears, students take tremendous pride in presenting a check that will help feed many people in their school community. "Empty Bowls is a highlight of our school year! ", said Maria, as she added freshly diced carrots to a simmering pot of broth. I asked the small, but busy group of students, "What makes this project so special for you?" Austin, proudly cleaning his preparation station, "We get to do something challenging, that we enjoy, and people appreciate." Mrs. Varela added, "The students are active, they are enthusiastic, and they're motivated. They receive immediate, authentic feedback for their recipes, and the dining experience they create. Today, they are rockstars!" The unexpected can happen in a crowded, bustling kitchen. There can be spills, burnt biscuits, or as was the case early this morning, the realization that it was Ash Wednesday, and there needed to be a few meatless offerings for some of the diners. Students adjusted, adapted, and demonstrated the ability to think on their feet. Mr. Heitz and Mr. Skony helped keep things focused and organized as dining tables stayed filled to capacity. It's obvious, there are purpose and joy in this classroom! On this frigid day, my bowl of chicken noodle soup really hit the spot. It was a special moment when a few students asked my opinion of the smell, flavor, temperature, and texture of the soups I enjoyed. They valued my feedback with a, "thank you", and immediately began discussing modifications to their recipes, and preparation processes. Self-assessment and reflection, right before my very eyes - authentic learning. For an educator, does it get any better? These days, it's a rare thing for so many staff members to be able to sit and eat together. The spoiled diners provided an authentic audience for these passionate, and energetic students. I found the following educational themes clearly evident; self-directed learning, problem-based learning, hands-on learning, passion-based learning, makerspaces, social-emotional learning, and community service. In addition to math, science, and vocabulary, students also practiced their modern learning skills; communication, collaboration, critical thinking, and creativity. By nature, people like to be a part of something special. We gravitate towards winners. Empty Bowls is a day made most special by winners with busy hands, and big hearts. Help amplify purpose, was it merely the soup that satisfied our appetites or was it something more? Under what conditions do learners gain the most satisfaction? ** Thank you for your time and attention. Since you made it this far, here are the recipes featured in PHS Empty Bowls 2016.